Neighbor Jeff and I make an annual trip to our local Big Wine Store to stock him up for his annual project. You may remember the adventures of Jeff’s Dinner Club – an undertaking in honor of his wonderful wife, Christine the Pie Queen. Jeff lovingly crafts one delightful meal per month for his lovely Lady of Confection. As a planner, he prefers to have all of his wines in place before the project begins. Jeff also likes themes and loves his grill, so we found ourselves in the South American aisle this time around. South American wine is food-friendly enough as it is, but it lends itself so very nicely to food dragged across fire. We ended up selecting a number of wines from below the equator for his year’s project. Since we were in the neighborhood, and since the Vine has been pretty heavily Eurocentric recently, I decided to snag a few bottles from South America myself. 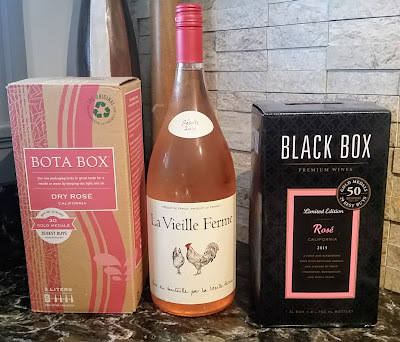 I wanted to try some varietals I wasn’t overly familiar with from that area of the globe. I pulled some “new for me” wine from Argentina and Chile. I also picked up my first-ever bottle from Uruguay. You know, for science – and for sharing, of course. Among white wines, Argentina is best known for a grape called Torrontes, the second-most widely planted grape in that country. (The largest white varietal in Argentina by acreage is Pedro Ximenez, which is also one of the grapes grown in Portugal to make sherry.) Torrontes is considered Argentina’s “national white.” I was musing to Jeff, “I wonder why the Argentineans don’t make sparkling wine with all this Torrontes.” My eyes flicked over a few degrees and I happened to catch a glimpse of a sparkling wine cage, in which was – you guessed it – a sparkling Torrontes. The bottle in question was Spirit of the Andes (NV) Sparkling Torrontes. From grapes grown in the Mendoza region, the largest winemaking region in Argentina, this sparkling wine is a refreshing enough sparkling quaff. Very pale in color, with a nose of apple blossoms, which move into a green apple-dominant flavor. It’s fairly acidic, and a little sharp on the carbonation. It was a decent enough sparkling wine, but it wouldn’t make me turn away from Cava as an inexpensive sparkling option anytime soon. $17 is a bit high for this one. A bit further down the Argentina aisle, I saw a bottle of the Humberto Canale 2008 Cabernet Franc, and decided give it a run. I’m familiar with Malbec, Bonarda, and Cabernet Sauvignon as Argentine reds, but not Franc. Cabernet Franc is a hit or miss varietal often used for blending which, on its own, tends to produce a relatively lean, tannic wine. Most versions have a finish that tastes like graphite, which makes it a “love or hate” wine for many folks. But one region’s blending grape can be another region’s gold mine – as when the French first planted the Bordeaux blending grape Malbec in Argentina and it exploded into world prominence. Maybe there was something interesting to be found here. The results were…mixed. I don’t know what kind of aging potential Argentine Cabernet Franc normally has, but this one might have been a bit on the downhill. The nose was of blueberries and violets with a barnyard-y funk in the background. I found it to be medium-bodied with a fair amount of dark fruit and a streak of earth. The finish is more blueberries, with a long line of pencil lead gradually trailing off. As it got some air, it developed more of the barnyard flavors, to the point where fruit largely faded. An inconclusive bottle, at best. Around $20. Just across the aisle was the selection from Chile. Thanks to the nation’s skinny geography covering over 2,600 miles of latitude, Chile produces a little bit of everything. Among reds, they predominantly produce Cabernet Sauvignon, Merlot/Carmenere, and Pinot Noir. I only remember trying one Syrah from Chile, so I thought it a ripe time for a revisit. I should have remembered the big Chilean wines require quite a bit of time to open up. 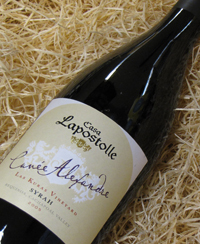 The fruit on the Lapostolle 2010 Cuvee Alexandre Syrah was basically nonexistent for about an hour after I opened it, so crack it well in advance if you’re going to go down this road. Once it opens (and even the next day), it turns into a right interesting drink. If you feel that French Syrah is too earthy and Aussie Shiraz is too fruity, this bottle from Chile might be a nice sweet spot for you. I thought this was quite nice. The nose is big with blueberries and a little bit of oak. The flavor is full of big dark fruits which are balanced capably by some punchy tannins. The flavors are full, making a solid wintertime red. With chocolate or big meats, it’s a solid choice at around $18. When the Sweet Partner in Crime and I were on a wine-tasting excursion in Italy several years ago, one of the other members of our group was going on and on about how wonderful Uruguay was. He said that the food and wine were basically the best in South America, and it was great – because almost no one knew about it. That was the last I’d heard of Uruguayan wine until I snagged this bottle. Uruguay’s “national grape” is Tannat. Tannat originated in southwest France and is used as a high-tannin blending grape to round off the edges and add structure to the Cabernet-based wines in that area, which includes Cahors. In this respect, Tannat seems to have followed Malbec’s terroir-driven path in Argentina – bursting from seldom-used blending grape into high production. We cracked this open next to an Indian-spiced version of a shepherd’s pie made with a base of lentils and a little bit of ground lamb. We made a heck of a good choice. The Marichal is an extremely easy to drink, low-alcohol entry – clocking in at 13%. This wine sees no oak, and the result is a lean, fruit-driven red with enough grape tannin to give it a very nice structure. I found scents and flavors of raspberries and cherries – it’s about halfway between a pinot noir and a light Cabernet Sauvignon. There’s a nice little undertone of smoke, too. I’d certainly give this high marks, and for $13, it’s a great value for the quality.